Interesting discussion about the PDB files, thanks. Has anyone managed to write a bootable floppy copy of The Goonies? Side B of the Happy Warp Backup disk has a PDB for it (#5, in case anyone wants to try themselves), but it won't successfully write a disk from either of the two ATX versions I have - both fail with a disk error on track 26. 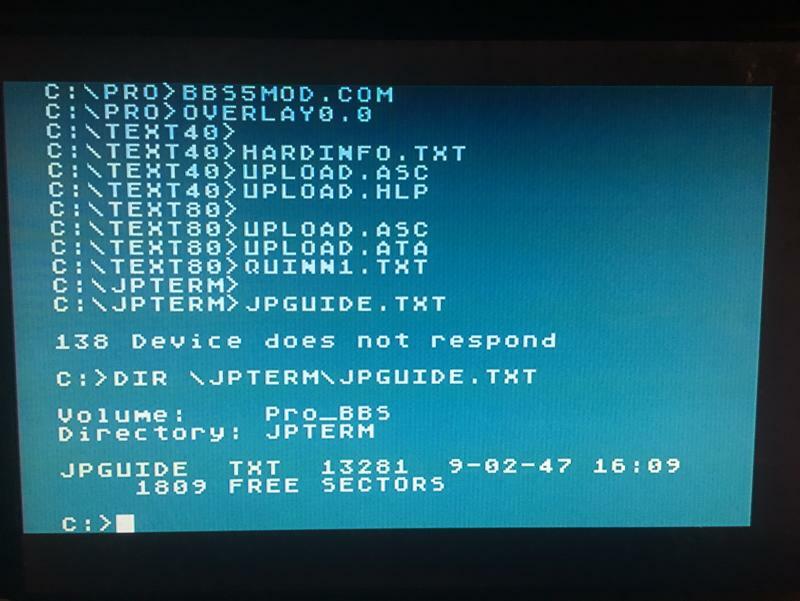 Trying a straight, no-PDB copy produces a complete disk but it fails during the boot at the credits screen but before the title screen and music appear. so I renamed the binary to respeqt32.exe and put it in one of my other versions folders and launched it, worked just fine. Edited by _The Doctor__, Wed Mar 13, 2019 11:37 PM. Ok. Assuming you are unsing the Windows version, I will try to make a complete package of the binaries. I have rebuild the binary packages for macOS and Win32 with my latest changes. Beware that these are only binary packages, you also need the complete package, you find here http://atariage.com/...beta/?p=4150092. Replace the binary in the complete package with the binaries found in the new ones. If there are problems, please PM me or ebiguy. I have found the bug in the last several versions of RespeQt. 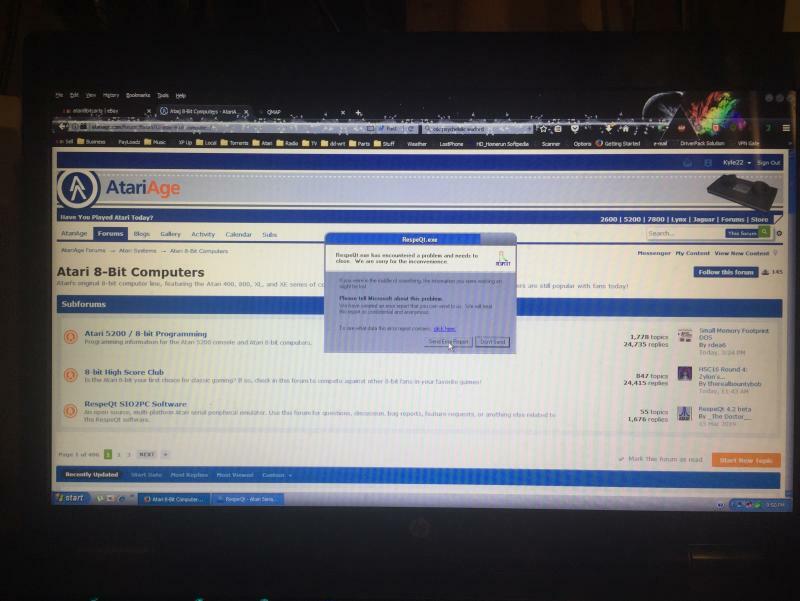 It crashes to an Error Report. This prevented me from doing a backup of my BBS until I found out the problem. I un-ARCd (IIRC, or possibly copied) some files to the drive and didn't notice their datestamp was 9 Feb 47. EVERY one of these files crashed RespeQt. After I did CHTD on the offending files I was able to do a full [Error Free] backup at divisor zero. Edited by Kyle22, Sun Mar 17, 2019 9:59 PM. Yep: dozens of users with files from the late Forties are going to be tripped up with this one. Critical! Perhaps RespeQt is attempting to create a file with a date stamp of 1947 or 2047, which I guess will create issues. Kyle22, thanks for the bug report. We will look into it. Edited by _The Doctor__, Mon Mar 18, 2019 5:21 AM. Here’s another issue/bug report combined with a question. In the current version, I cannot use the Explore disk option to copy files into the disk image. I’m sure I’ve done this in the past but it doesn’t appear to be working on my 4.3 installation. Perhaps relatedly, although RespeQt lets me mount a folder as a drive(e.g., my Desktop), I cannot seem to access any files stored there even to load them. I’ve used this process in the past so I know it used to work. Be nice to know if anyone else has run into these issues. Is this on a specific platform, or on all? Hi, thank you for using and testing and reporting issues on RespeQt. I found the bug (my fault !). But before rebuilding, I am going to look at the issue about last modified date. I am not sure to understand how to reproduce the problem. I understand that you have a file with date 47 but where is it (what is C: on your screenshot ?). Is it an ATR image in RespeQt or a folder image or a real hardisk plugged in the Atari (SIDE2 + CF card). Could you provide a very detailed explanation of the configuration and the procedure to follow so I can reproduce (what do you configure in respeQt, which commands are run under DOS...) ? AFAIK Unix can only address years until 2038. Perhaps it is failing due to the fact that the files are tried to be timestamped with the year 2047. Normally, the tinestamp should wrap around. My guess would be, that a Date object is supposed to be created, but couldnt be. So the program crashes. Copying from hard drive partition D3: (C: drive) to RespeQt using PCLINK protocol. Edited by Kyle22, Mon Mar 18, 2019 5:01 PM. It's not problem on the Atari side. Or, for purposes of speed, just re-date them on the fly to today's date. Edit: The current date as of time of file transfer. Obviously, not Today's (this day's) date. Edited by Kyle22, Mon Mar 18, 2019 10:14 PM. - avoid the crash and ignore the bad date. - fix the communication issue with folder image. Could you please test this version and tell me if it is OK.
Sure, when I get home. I'm on my phone now. Well, it seems as if SDX 4.47 doesn't allow me to change the year to 47. Doing another full backup now. Edit: I'll RTF the SDX M.
CHTD will not do this. I must sector-edit or find the original source of he offending files. No prob. I'll get this. Hold on. I'll do this tomorrow. Backup still running nice at divisor zero. It's getting late. Board will beck up in the morning. Edited by Kyle22, Thu Mar 21, 2019 10:46 PM. Sorry, brain fart. I guess if I set the date first, then do CHTD, then set it back should do the job. Sorry, I guess I forgot to report that it works perfectly now. Thanks. The bad dates are on the files contained in an ARC. Un-ARCing them to hard disk is what triggered the bug.